Simple Local's brewed coffee and espresso-based drinks are excellent, and nicely showcase local roaster Sterling's fine coffee. Service is warm and friendly, and the attractive room has tables as well as counter seats, which make it a great place to meet friends or business acquaintances. Tasty pastries, baked in-house, are available and pair very well with the shop's coffees. This little coffee house has a great funky/bluesy vibe with some of the best pastries that you will find in Portland. 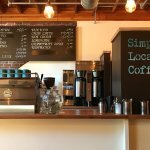 Been to Simple Local Coffee? Share your experiences!